Please join our dancers as they share the variations, repertoire, character, and contemporary they have learned during the 3 week session. Each year the students amaze us with their extraordinary improvements during this short intensive time. This summer we are pleased to offer this demonstration at the Cary Arts Center (CAC) conveniently located in downtown Cary. CAC is an intimate theater in the heart of the arts and historic district in downtown Cary. CBC believes strongly that additional stage experience for dancers is an essential component in their training. Showcase II will be Saturday, August 4 at 5:00pm. 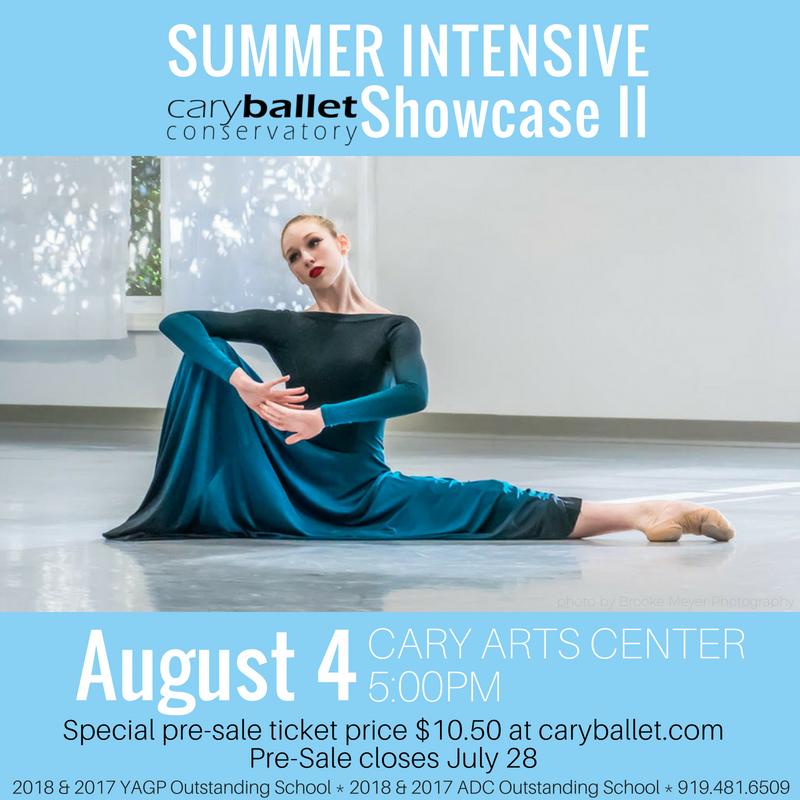 Cary Ballet will be pre-selling a limited amount of tickets for $10.50 through Saturday, July 28 (one week prior to Showcase II). After July 28, tickets will be available via the Cary Box Office with an additional processing fee of $2 per ticket. All tickets are for general seating. Children under the age of 2 are free (in lap).There are no refunds or exchanges.